Editor's note: This feature is a history of studies of early Americans and serves as a primer for the following feature. This map shows the extent of the Laurentide Ice Sheet (LIS) at about 11,000 years before present, generalized from Deglaciation of North America and overlaid on the North America shaded relief map (courtesy of the U.S. Geological Survey EROS Data Center). Inset shows the western limit of the LIS and the location of the Foothills Erratics Train, which lies along a zone of coalescence between LIS and glaciers from the Cordilleran Ice Sheet. Earliest known archaeology sites are C - Charlie Lake; V - Vermilion Lakes; S - Sibbald Creek; W - Wally's Beach; N - Niska. Image courtesy of Lionel E. Jackson Jr. In 1927, a visit by eminent paleontologists to an excavation in the wall of an arroyo near Folsom, N.M., confirmed that humans had coexisted with extinct Pleistocene animals at about the time of the Wisconsin Glaciation in North America (now known to have occurred between about 25,000 and 10,000 years before present). The excavation of a butchering site revealed finely crafted thin, leaf-shaped stone projectile points imbedded in the bones of large bison. These distinctive projectile points, dubbed "Folsom points," were fluted on each side to facilitate securing them to projectile shafts. Paleontologists uncovered an even older site with indisputable evidence of human hunting of mammoths in 1932 near Clovis, N.M. However, this location revealed a different type of projectile point, longer than the Folsom point and with a partial flute on each side. The researchers named the points and the people who created them "Clovis." The question immediately arose as to how these hunters had reached the mid-latitudes of North America at a time when the northern half of the continent was apparently buried beneath the Laurentide and Cordilleran ice sheets. In 1933, W.A. Johnston of the Geological Survey of Canada (GSC) proposed an answer. He and colleagues had investigated the Pleistocene geology of the Rocky Mountain foothills of Alberta between Calgary and the Montana border. They believed that there had been several overlapping advances of the Laurentide ice sheets and glaciers from the Rocky Mountains. What remained unclear to Johnston at the time, however, was whether the glaciers actually had coalesced or whether the mixed provenance tills along the Rocky Mountain Foothills represented out-of-phase advances of glaciers from the Rocky Mountains and the Laurentide Ice Sheet. He favored a more restricted Wisconsin Glaciation limit of the Laurentide Ice Sheet and, on this basis, proposed that people could have reached the lands south of the ice via a passage between glaciers advancing into the plains from the Rocky Mountains and continental glaciers. In 1935, Ernst Antevs coined the term "ice-free corridor" to describe this passage. Johnston's suggestion was a bold one, as it was based on very modest geological evidence. Such a corridor would have stretched 2,500 kilometers from the limits of glaciation along the Arctic coast in northern Yukon to northern Montana. Only the most general of geological surveys had been done for this area by 1933 and basic topographic mapping of much of it was not completed for another 20 years. Systematic surficial geology mapping for most of the region was not completed until the 1990s. Despite numerous archaeological surveys, it has taken almost 60 years for a rigorous test of the hypothesis that the ice-free corridor was the path by which the first Americans reached the mid-latitudes. To do so, researchers have developed several analytical techniques, including radiocarbon and cosmogenic exposure dating, to resolve geological and archaeological controversies. Through the investigation of pre-Clovis archaeological sites and the reconstruction of North America's glacial past, scientists are now suggesting that the ice-free corridor may not have been a feasible route for the early Americans. The northern ice-free corridor encompasses the Mackenzie Mountains, the northern continuation of the Rocky Mountains and the adjacent valley of the Mackenzie River. It is essentially a roadless area accessible only by helicopter or airplane. Regional mapping of this area by GSC geologists Alejandra Duk-Rodkin and Owen Hughes in the 1980s and 1990s determined that the limit of the Laurentide Ice Sheet from the last glacial maximum represented the alltime limit of glacial ice cover. Furthermore, they cited evidence that suggested that the maximum push of the ice sheet into the front (Canyon) ranges of the Mackenzie Mountains occurred as early as 30,000 years before present as determined by radiocarbon dating (YBP). However, a revisiting of the chronology of the maximum advance of the Laurentide Ice Sheet in this region by Arthur Dyke of GSC and university colleagues in 2002 concluded that the maximum advance was more likely in the range of about 21,000 YBP, which is compatible with the last glacial maximum. Duk-Rodkin also mapped re-advance positions of the Laurentide Ice Sheet. She concluded that the actual opening of a corridor to the south could not have occurred until about 13,000 YBP and extensive glacial lakes occupied much of the area until around 12,000 YBP, affirmed in subsequent studies by Dyke and colleagues. Settling the glacial history of the southern part of the ice-free corridor proved to be a thornier problem, with two competing interpretations of stratified glacial tills along the Rocky Mountain foothills and adjacent interior plains. One camp viewed these tills as representing deposits of several separate glaciations, spanning perhaps hundreds of thousands of years. The other camp viewed them as the result of glacial advances and retreats during a single glaciation, complicated stratigraphically through ice-thrusting of sediments. A significant aspect of the controversy was determining if and when glaciers from the Rocky Mountains merged with the Laurentide Ice Sheet. The key to solving the debate lay in the discovery of the origin of the Foothills Erratics Train, a remarkable feature consisting of thousands of quartzite boulders ranging up to car-sized and even house-sized blocks. In the 1950s and 1960s, GSC geologist Archie Stalker and others traced the boulders over 600 kilometers from northern Montana northwestward to the Mt. Edith Cavell area in Jasper National Park. They found that the erratics train was as narrow as a kilometer in some areas and was found in a belt of mixed Rocky Mountain and Laurentide Ice Sheet till. The only viable explanation for the narrow belt and its southward deflection parallel to the Rocky Mountain foothills was that the erratics were transported along a zone of coalescence between valley glaciers that advanced from the Rocky Mountains and the southwestern margin of the Laurentide Ice Sheet. But when? The work of two groups would help settle the dating. Jim Burns of the Provincial Museum of Alberta and Robert Young, then at the University of Calgary, obtained radiocarbon dates from bones found in gravels beneath the single Laurentide till that exists in the Edmonton area. This underlying preglacial gravel lacks any clasts derived from the Canadian Shield, the source of the Laurentide Ice Sheet. Twenty-nine sub-till radiocarbon ages fell between 21,000 and 43,000 YBP. These ages plus others from locations northwest and south of Edmonton indicated that the last Laurentide Ice Sheet was the only continental ice sheet ever to inundate the Edmonton area and, by inference, reach the eastern margin of the Cordillera to the west. 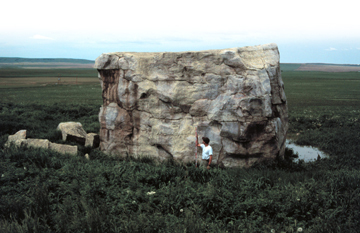 This example of one of the Foothills erratics lies near Glenwoodville, Alberta. Its upper surface yielded a cosmogenic chlorine-36 exposure age of about 17,000 years indicating that it was emplaced during the last glacial maximum. Image courtesy of Lionel E. Jackson Jr. The second research group, comprising first author Jackson in collaboration with Fred Phillips at New Mexico Tech and GSC colleagues, set out to directly date the emplacement of the Foothills Erratics Train and other erratics, marking the alltime Laurentide Ice Sheet limit along the Canada-United States border, using cosmogenic chlorine-36 exposure dating. Phillips had previously applied this technique to moraines in the Mackenzie Mountains with Duk-Rodkin. Twelve exposure ages on the Foothills Erratics Train showed them to have been emplaced between 11,000 and 18,000 YBP, which falls within the Wisconsin Glaciation. Furthermore, 16 ages determined on erratics along the limit of glaciation by the Laurentide Ice Sheet yielded compatible ages, in the range of 12,000 to 22,000 YBP. These ages not only corroborated the dated stratigraphy from the Edmonton area, but also, taken with the results from the Mackenzie Mountains, showed that the last Laurentide Ice Sheet surpassed all previous ones in extent in western Canada. The implications for the ice-free corridor hypothesis from this body of work were clear: There had been no ice-free passage south along the eastern margin of the Cordillera from about 21,000 YBP (perhaps earlier) to as late as 12,000 YBP. This left little or no time for Clovis people (circa 11,200 YBP) to reach the mid-continent; the route would be untenable if people were in the Americas prior to 12,000 YBP. For archaeologists, the glacial findings were disquieting; the idea that the ice-free corridor had been the route for peopling of the mid-continent was well-entrenched and appeared to have no credible alternatives. However, existing archaeological evidence from the corridor region is consistent with the new geological chronology. Few archaeological or paleontological sites in the corridor area are older than 10,000 YBP, and only paleontological sites have yet given dates over 11,000 YBP. The earliest archaeological sites include the Vermilion Lakes site, near Banff, Alberta; the Sibbald Creek site in the Alberta Foothills; Charlie Lake Cave in northeastern British Columbia; and Niska in southern Saskatchewan. At Charlie Lake, people were using fluted projectile points more than 10,500 YBP, but these were points that fit neither the Clovis nor the Folsom category; they are smaller, more triangular, and have multiple flutes at the base, a distinctive enough pattern that they are now called Charlie Lake points. One of the most striking relationships from a geographical standpoint is that the distribution of fluted projectile points on the Canadian plains, as mapped by second author Wilson, fits very well into the southern half of a corridor between the Cordilleran and Laurentide ice sheet margins for about 11,000 YBP as depicted in the Deglaciation of North America by Dyke and GSC colleagues. This ice margin was reconstructed independently based on nonarchaeological data. The oldest fluted-point sites are still those in the southern Great Plains and American Southwest, so this distribution seems more consistent with a northward movement of fluted point-using peoples from the mid-continent than with a southward movement through the ice-free corridor. Archaeologists have found a few fluted points in Alaska, but none in dated contexts, giving little evidence to suggest that they are comparably old. Cultural assemblages in Alaska that are of antiquity comparable to Clovis are technologically different from those of the mid-continent. Corroborative evidence for a northward movement of fauna into the opening corridor comes from the late Wisconsinan vertebrate faunas (circa 11,500 to 10,000 YBP) found in the Canadian plains. These include numerous finds, such as those from gravel pits in the Cochrane-to-Calgary and Peace River areas, described by C.S. Churcher of the Royal Ontario Museum and Wilson, and from loess at the extensive Wally's Beach site on St. Mary Reservoir in southern Alberta, described by Brian Kooyman, Len Hills and co-workers at the University of Calgary. The faunal assemblage includes mammoths, camels, bison, helmeted musk-oxen and horses that again strongly resemble southern species. Bison resembling Alaskan species did not appear on the southern Alberta plains until about 10,500 YBP, if indeed even those were truly of Alaskan origin. It appears that as the glaciers receded, southern-derived fauna moved northward to colonize the newly available territory, which probably resembled open tundra to steppe for the first millennium or so of exposure. In fact, the ice-free corridor also saw the transient presence of numerous, sometimes extensive glacially dammed lakes, given that the regional gradient dropped eastward and meltwaters pooled against the retreating Laurentide ice front, spilling southeastward along the margin in the southern corridor and northward in the northern corridor. Ephemeral ice dams were prone to failure, resulting in frequent outburst floods along the ice margin. Despite decades of aggressive efforts by archaeologists from the universities of Alberta, Calgary and Lethbridge, together with the "First Albertans" program of the Archaeological Survey of Alberta (now within the Provincial Museum of Alberta), no credible pre-Clovis finds have yet been found in datable contexts within the corridor area. A potentially exciting find of human remains, the "Taber Child," was made by Stalker of in what appeared to be Pleistocene deposits, but was reinterpreted to be Holocene upon further excavations and radiocarbon dating by Wilson and R.G. Forbis. Archaeologists may ascribe part of the paucity of early archaeological material to widespread landscape instability and preservation factors; however, the rarity even of radiocarbon-dated vertebrate remains older than 11,500 YBP stands in striking contrast to their abundance in immediately younger deposits. 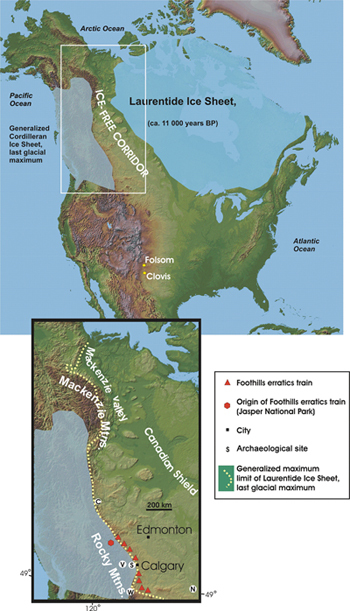 This evidence is consistent with a view that the corridor was closed during the last glacial maximum and unavailable as a dispersal route until Clovis times, if not later. The weight of evidence therefore seems to point to the fact that the ice-free corridor was a transient feature at best, of late Pleistocene age. The Cordilleran and Laurentide ice sheets coalesced, closing off any "corridor" through most of the Wisconsin Glaciation. The opening of the corridor was biotic as well as physical: For each species of plant or animal, there was an "opening" in terms of opportunity and dispersal ability. Physical opening did not initiate a sudden stampede southward. Given the evident antiquity of South American Paleo-Indian sites, which predate the oldest Clovis site by a thousand years, the role of the ice-free corridor seems moot. Thus it would appear that evidence for the earliest human migrations to the mid-continent should be sought elsewhere, and the west coast is becoming more and more credible as an alternative. Radiocarbon dating is the most frequently used method of dating in the Quaternary. Carbon has two stable isotopes, carbon-12 (12C) and carbon-13 (13C)  of which 12C is 500 hundred times more abundant  and one unstable radioactive isotope, carbon-14 (14C), which forms in the upper atmosphere, where its concentration relative to 12C is minute. Half of a quantity of 14C formed at any given time will decay to nitrogen-14 every 5,730 years. Radiocarbon (14C) enters the tissues of all living things, including bones and shells, while they are alive and consuming carbon from the atmosphere or oceans. Once the organism is dead, the radiocarbon clock begins to tick. Because of its geologically short half-life, the method is only applicable to approximately the past 50,000 years. Radiocarbon dating measures the concentration of 14C in a specimen. Using that concentration relative to the concentration of 14C present in the atmosphere in the year 1950 ("year zero" for 14C dating) permits the calculation of an age based upon the 5,730-year half life. The method also assumes that the 14C:12C ratio in the biosphere and hydrosphere is in equilibrium with the atmosphere, and that the organism has not incorporated additional 14C since its death. However, by 14C dating of tree rings, each of which represent a calendar year (one revolution of Earth around the Sun), researchers have determined that radiocarbon-dated years differ from calendar years. This discrepancy is due to the fact that 14C concentrations vary over time because of fluxes in Earth's magnetic field (and, more recently, nuclear weapons testing in the atmosphere). Much research has been devoted to correction of radiocarbon years to calendar years because the relation is not a straight-line function. Further, it is difficult to recalibrate radiocarbon dates older than approximately 15,000 years. To avoid misunderstanding and conversion error, scientists usually publish radiocarbon ages and define the method used in citing ages throughout their publication: for example, 11,500 radiocarbon years before present (YBP or RYBP). For a detailed explanation of radiocarbon dating, cosmogenic exposure dating and other methods used for in Quaternary research, see Jay Stratton Noller, Janet M. Sowers, William R. Lettis (Editors), 2000, "Quaternary Geochronology: Methods and Applications." AGU Reference Shelf Series, Vol. 4, American Geophysical Union, Washington. Jackson is a Quaternary geologist with the Geological Survey of Canada in Vancouver, British Columbia, and an adjunct professor of earth science at Simon Fraser University. He has mapped the surficial geology of extensive areas of the Alberta Foothills and Yukon Territory. He has a longstanding interest in how and when the first people came to the Americas. Wilson is an instructor in both the department of geology (of which he is past chair) and the department of anthropology at Douglas College, New Westminster, British Columbia. His primary research interests are vertebrate paleontology, Quaternary stratigraphy, geoarchaeology and human-landscape interactions. He is also adjunct professor of archaeology at Simon Fraser University. Dyke, A., Andrews, J.T., P.U, C., England, J., Miller, G., Shaw, J., and Veillette, J. 2002. The Laurentide and Innuitian ice sheets during the Last Glacial Maximum. Quaternary Science Reviews, 21: (1-3): 9-33. Fedje, D.W., J.M. White, M.C. Wilson, D.E. Nelson, J.S. Vogel, and J.E. Southon. 1995. Vermilion Lakes site: adaptations and environments in the Canadian Rockies during the latest Pleistocene and early Holocene. American Antiquity, 60(1): 81-108. Fladmark, K.R., J.C. Driver, and D. Alexander. 1988. The Paleoindian component at Charlie Lake Cave (HbRf 39), British Columbia. American Antiquity, 53:371-384. Jackson, L. E., Jr., F. M. Phillips, K. Shimamura, E.C. Little. 1997. Cosmogenic 36Cl dating of the Foothills Erratics train, Alberta, Canada. Geology, 25(3): 195-198. Wilson, Michael C., and J.A. Burns. 1999. Searching for the earliest Canadians: wide corridors, narrow doorways, small windows. In: R. Bonnichsen and K.L. Turnmire (eds.) Ice Age People of North America: Environments, Origins and Adaptations, pp. 213-248. Oregon State University Press and Center for the Study of the First Americans, Corvallis, OR.